Rivercity Car Care can supply and fit any electrical accessories, batteries or vehicle lighting. Our team of expert mechanics will use state-of-the-art diagnostic equipment to identify and fix your car’s electrical faults. Our South Brisbane based auto electricians specialise in the latest electronics and can repair and install everything from bluetooth to the latest stereo equipment. prevent wheel lockup and skidding. Our qualified mechanics provide comprehensive ABS diagnostic and repair services. Rivercity Car Care also offers full servicing, maintenance and installation for electronic braking systems for all types of ‘towed’ configurations including trailers, campervans, trailers and caravans. Modern vehicles contain sophisticated and complex auto-electrical systems incorporating everything from dashboard lighting to automatic parking technology. These systems provide consumers with more efficient, safe and environmentally-friendly vehicles. However, complex electrical systems can result in complex electrical faults that must be located and repaired by automotive experts. Our auto electricians in South Brisbane are experienced in diagnosing and repairing simple and complex electrical faults in all vehicles. Our auto electricians in South Brisbane will identify your car’s electrical faults quickly and efficiently. You will always be consulted before any major or expensive repairs are undertaken on your vehicle. 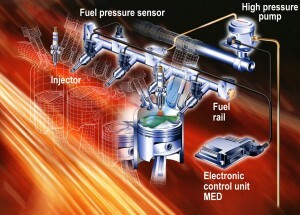 Electronic fuel injection involves mixing fuel and air within an internal combustion engine.